Wednesday afternoon, less than an hour before the Arizona Diamondbacks and Colorado Rockies played the final game of a three-game series at Coors Field, there were Rockies pitchers Franklin Morales and Juan Rincon, in uniform, standing in front of the Arizona dugout, laughing and chatting with Arizona pitcher Juan Gutierrez and outfielder Gerrardo Parra. Maybe what it all boils down to is, quite simply, Rodriguez is the high-priced poster boy for an age of self-indulgence. If so, he wears the label well. I'm not 100% sure what Ringolsby is getting at here, or what it has to do with Rodriguez, but I think I have a pretty good idea while why it's no longer in the article! Tom Hicks, the man who is attempting to sell the Texas Rangers, was able to cover the Rangers’ share of Rodriguez’s 10-year, $242 million deal signed before the 2001 season, despite Hicks’ bankruptcy problems. It’s the working stiffs with the Rangers, the ones who had their future caught up in a Hicks-created retirement plan, who are left with nothing to show for their efforts. So yes, there you have it. A-Rod put a gun to Tom Hicks' head, forced him to conjure up a $242 million (actually $252 million deal), and sent Hicks spiraling into bankruptcy, and the little people into soup kitchens. Never mind that Rodriguez's deal was signed nearly nine years before his current troubles, or that he was traded from the team six years ago, freeing them of 2/3 of the obligation of his deal, and that when he opted out in 2007, the Rangers didn't have to pay him any more money. But somehow, it's all A-Rod's fault for Hicks' financial troubles, including pension issues that apparently nobody but Ringolsby knows about. But Rodriguez is hardly alone in not showing respect for the game. There are now almost nightly highlights that show a player charging the mound after being hit by a pitch. Off the top of my head, I can remember exactly one player charging the mound last year - Kevin Youkilis against Rick Porcello last year. It just doesn't happen that much. Maybe that's because the days where hitters would get hit in the head or neck for digging in at the batters' box just don't happen that much anymore. But what the heck does this have to do with A-Rod? The writer doesn't even try to tie it into the Varitek fight. At any rate, Ringolsby may have once been a great sportswriter, but if this column is any indication, he's lost a ton off his fastball. Is it too early to start talking about Robinson Cano as an MVP candidate? I'm going to answer my own question in the headline and say, yes, it's way too early to start talking about Robinson Cano as a candidate to win the 2010 AL MVP award. That being said, it's perfectly fine to say that he ought to be getting the AL Player of the Month honors, especially after a game like last night's win, where he hit two homers and made a nifty - make that amazing - defensive play. 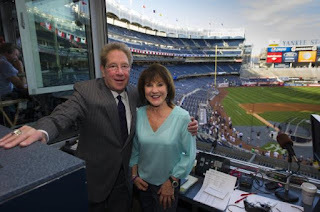 John Sterling must have been going nuts on the radio during yesterday's game. Did he roll out any other calls for the second homer besides "Robbie Cano...Don'tcha know?" Looking like a wax figure, Sterling was posed and positioned so perfectly and prominently in the Yankees/President photos and videos you'd have recalled that he made the catch on Bill Mazeroski to end the 1960 World Series, then, in 1996, sold his playoff seats to Jeffrey Maier's dad. Even a fellow local team radioman couldn't resist comment about Sterling's intrusive presence. During Tuesday's Dodgers-Mets game, Howie Rose said he's going to take another look at his "Sgt. Peppers" album cover because Sterling, perhaps next to Marilyn Monroe, must be in there, somewhere. In other news, how about A.J. Burnett last night? Frankie Cervelli does a great job of getting the best out of Yankee starters, doesn't he? It looks like The Wall Street Journal's new beefed-up sports section is trying to be all edgy these days. They've come up with a very controversial list of the top 10 Yankee position players. But the WSJ are unable to really back up their picks with anything more than "because we said so" criteria. And the way they downgrade Yankee greats like Mickey Mantle is just ridiculous. The categories included postseason batting, fielding range, on-base plus slugging percentage and wins above replacement player. We also included the player's impact on team attendance and his effect on the value of the franchise. To give a more rounded portrait, we scored each candidate by their relevance in popular culture, upstandingness and earning power in the collectibles market. The totals were compiled by giving each player a score (1 to 10) in each of 11 categories and tabulating the results. Collectibles? Is this the ranking of great players or bobbleheads? In the end, DiMaggio fell to third in our rankings, behind Lou Gehrig, for another reason: likability. At the Yankees' Old-Timers' Day celebrations, the famously petty DiMaggio insisted on being introduced last, according to long-time team PR man Marty Appel. The WSJ can't even get that tidbit straight. The egotistical part wasn't DiMaggio being introduced last. After all, Yogi Berra gets that treatment today. No, what was over the top about it was that Joe insisted on being introduced as the "greatest living ballplayer." At any rate, I wouldn't have DiMaggio even that high on my own list. He would be fourth, below Mantle. Nothing to do with likability, but with longevity. And if Derek Jeter gets 3,000 hits, I would put Jeter above Joltin' Joe. But on the WSJ's list, Jeter gets ranked above both Mickey Mantle and Yogi Berra. The WSJ downplays Mantle, saying that "despite his many accomplishments, Mantle also benefitted from dumb luck." Yeah, right. It was really lucky when the rookie Mantle got his spikes caught in a Yankee Stadium drainpipe cover in the 1951 World Series, and tore up the ligaments in his knee. And how he never played in another game without physical pain in his career, and injuries kept him from being even greater. Oh, and the fact that all the men in his family, including his father, died young (he and his father were side-by-side in hospital beds when Mantle first hurt his knee) helped drive him to drink. But the WSJ thinks Mantle was lucky because he "joined the Yankees in 1951, the same year major-league games were first broadcast in color and nationally" and "became the face of a loaded team that reached 12 World Series in 14 years." Never mind that most Americans didn't even have TVs in 1951, and color TV didn't become mainstream until at least 15 years later. And that Mantle was the No. 1 reason those Yankees were "a loaded team" in the first place. Also, where the heck is Don Mattingly on this list? By the WSJ's own criteria on likability, value to the franchise, and importance in pop culture, Donnie Baseball should be in the top 10. He was only the most popular Yankee player of an entire generation, after all. Reggie Jackson and Alex Rodriguez are No. 7 and 8. The WSJ says "both of whom made the list largely on the strength of their offensive statistics -- in the regular season and the playoffs." Hmmm, has the paper already forgotten how much grief A-Rod got for his postseason numbers until 2009? Besides, these are two of my all-time favorite Yankees, but even I wouldn't put Reggie in the top 10 - he was only on the team for five seasons, after all. And A-Rod should end up in the top 10, but I still wouldn't put him at No. 8 at this point, given that he's only been with the team since 2004. Joe Gordon is No. 9 for "defense." But is he an all-time top 10 Yankee? I don't think so. Tommy Heinrich makes No. 10 because "the team's winning percentage during his career was the highest for any player." Huh? Was he single-handedly responsible for that? Please. Mantle gets downgraded because he was part of a "loaded team," while Heinrich makes the top 10 for being part of a loaded team? How does that make any sense? I guess the WSJ is trying to make an impact on the New York sports scene, but between this article and the way that they twisted around statistics to make sure that A-Rod would have the longest home run trot numbers, color me unimpressed with their new sports stuff. What did I say about that Sports Illustrated cover jinx? When I saw that Jorge Posada got hit in the knee during last night's game, my first negative thought wasn't about the Orioles. It wasn't even about why Jeremy Guthrie lost control - again - when it came to a Yankee batter. It was about Tom Verducci and Sports Illustrated putting Jorge Posada on the cover this week! This is why I never want the Yankees to be on the cover of SI during the season. Nothing good can come of it! Did you notice how Ken Singleton called the plunking? He said, "Look out," like he always does, and then went, "Hor-HEY", with the emphasis on the second syllable. Here's the clip. According to MLB.com, Jesus might be coming to the Bronx because of this. Jesus Montereo, that is. He, along with Chad Moeller, is one of the AAA catching prospects who might come up to the big leagues if Posada has to miss a bunch of time because of this knee injury. Posada: They're talking about speeding up the game, speeding up the game. Listen, they talk about the Boston-Yankees series? Friday we're on TBS, Saturday we're on Fox and Sunday we're on ESPN. It's 2:30, 2:25 and three minutes between innings. And that tells you why the game is taking forever. At any rate, I hope Jorge is A-OK today. Bandwagon Yankee fans don't go out in the cold. Orioles fans rarely go at all. I was at the game today and got to see another Met first - John Maine became the first Met starter besides Johan Santana and Mike Pelfrey to get a win this year. Going into today's game, Maine, Jon Niese and Oliver Perez were a combined 0-4 in twelve starts. The Mets went 9-1 on the homestand. I saw Maine pitch twice on the homestand and he won both games. I needed my new Met ski cap at both games. Maine pitched into the seventh today for the first time. It was only the second time all year that a pitcher besides Santana or Pelfrey made it that far. I was so skeptical that Maine would last that long that I left my seat in the top of the sixth to use the rest room and get some hot chocolate (when I got my Met ski cap last Friday, I did not expect to be using it again so soon!). I figured that Maine would not last the inning and there would be a pitching change. But by the time I got back to my seat, Maine had struck out the side and my companions did not want to let me sit down because Maine was doing so well in my absence. I hate to point out that the three batters Maine fanned were Casey Blake, Ronnie Belliard and Xavier Paul - not exactly Murderer's Row. Or that Ollie had a good start a week and a half ago and there was much talk of how he was turning it around. The Mets really need Maine to do well because the most likely replacement starter, Hisanori Takahashi, is a lefty, so he would be less likely to replace Maine, since that would give the Mets four lefty starters. But Takahashi could replace Perez. Still, the Mets have managed to go 9-1 with the rotation as is, so it's hard to complain. And it's great to see the other manager for a change being the one to say "we battled." "I was a lot more comfortable with the energy today," Dodgers manager Joe Torre said. "We battled it. I think the effort was there. We’ll get it straightened out, eventually." Squawker Lisa, the Mets are still in first place, and have a big showdown with the Phillies this weekend. But you have something to look forward to as well - Javier Vazquez gets to face one of his former teams, the White Sox, in front of his adoring home fans. This Swan is in a foul (or is that fowl?) mood this morning. I missed most of the Yankee game, came home in time to see them start a two-run rally against the Orioles, only to see A-Rod swing on the very first pitch (what's up with that?) to end the rally, and the game. And the way Michael Kay shrieked at the end was weird. Dude, the Yankees lost! Don't act so excited. Now the Yankees have lost four of five, which is bad enough. But what's even worse is that it's coming at the same time the Mets have won six games in a row. And to top it all off, the Mets are now in first place! So that means I'm going to have to hear all the crowing from Squawker Jon and other Mets fans. The Mets scored three runs in the fifth inning and four more in the sixth, pounding the Dodgers middle relievers Ramon Troncoso, Jon Link and George Sherrill. All three of those pitchers were also used in the first game of the doubleheader. For Troncoso, the appearance was his 14th, the most ever by a Dodger pitcher in the first 20 games of the season. For a while now, I've been pulling my punches against the Mets, because they were too pathetic to really mock. But now that they're winning again, the gloves are off. Watch out, Squawker Jon! The Mets are alone in first place! Sure, it's only April, but I didn't think this day would come at all this year. I was hoping for meaningful games in September. Squawker Lisa, Joe Torre may not be welcome in the Bronx, but you'll be pleased to know that he did get to see a first-place New York team during his East Coast trip. In fact, his sorry team helped them get there. But while the Dodgers, Braves and Cubs have all looked pretty bad against the Mets, when a team wins eight of nine, they must be doing something right. For most of that time it was the starting pitching. Tonight, in game 2 of the doubleheader, the bats finally woke up, particularly David Wright's. Thank you, Torre's bullpen! No more talk of hanging tough until Carlos Beltran gets back. Beltran may never get back at this rate. If he does, great. But if not, the Mets tonight showed they have the potential for a strong lineup even without Beltran. There were so many highlights today - Wright's breakout game, Jason Bay's first Met homer, Ike Davis' two-run double, and on the pitching side, Johan Santana's scoreless start despite not having his best stuff and Hisanori Takahashi stellar again in long relief. But my favorite moment of the doubleheader might have been what appeared to be the lowest point - Oliver Perez walking the pitcher on four pitches, loading the bases. The Mets still led, 3-2, and it was only the fourth inning, but Jerry Manuel had seen enough, and he pulled Ollie from the game. Earlier in the day, I criticized Manuel for planning to start Perez Sunday night against the Phillies before the rainout changed the rotation. But tonight, Manuel was decisive, cutting his losses with Perez and giving the Mets a chance to win. This is not to say that they can't win with Ollie, but they couldn't win with Ollie tonight. Keep him in the rotation, but keep him on, as the announcers noted, a very short leash. On this homestand, Manuel has gotten the best of Torre, Bobby Cox and Lou Piniella. And right before that, Tony LaRussa, whose dubious moves in the 20-inning game continues to have consequences. Cardinal infielder Felipe Lopez went on the DL with an elbow strain. Lopez thinks his elbow got worse when he pitched an inning in the marathon game. Lopez threw 21 pitches in that inning. Manuel outmanaging Hall of Fame managers. Omar Minaya making the right move in bringing up Ike Davis, even if it should have been three weeks earlier. The Mets are in first place. Amazing! How could Jerry Manuel plan to use Oliver Perez over Johan Santana against the Phillies? The Mets are now a game out of first, with a big series against the Phillies coming up this weekend. Whom would you rather see pitch for the Mets on Sunday - staff ace Johan Santana or staff enigma Oliver Perez? Before Monday's rainout, Jerry Manuel was going with Perez. Using the same sort of rigid thinking that prompted Manuel to bat Mike Jacobs fourth because it was more important to have a lefty break up the righties than to have a major-leaguer hitting cleanup, the Met skipper did not want to skip anyone in the rotation, even with off days and pitchers of vastly different quality. So Santana, scheduled to start Tuesday, was going to be passed over Sunday night because Thursday's off day would push back the whole rotation and make it Ollie's turn to pitch. Monday's rainout means that both Ollie and Johan are pitching today, which gives Jerry the out to rework his rotation. Now it appears that Santana will pitch on Sunday against the first-place Phillies instead of Monday against the Reds. But Santana always should have been pitching on Sunday. The only reason Manuel wanted Perez to face the Phillies was that he did not want Ollie to go six days between starts. Perez has exceeded expectations so far with an ERA this season of 3.71, but his WHIP is 1.53 with the help of ten walks in 17 innings. It's not as if he's in such a groove that nobody should upset his routine. The Yankees were willing to skip Phil Hughes until April 15, but Manuel won't skip Ollie? Tony LaRussa managed the 20-inning game for the long haul. He did not appear to care if the Cardinals won the game because they are the heavy favorites in their division and LaRussa has no worries about losing his job. The first week of May is way too early for a critical series, but Manuel can't pull a LaRussa this weekend against the Phillies, for his sake and for the team's sake. Would the Yankees have won 2009 with Joe Torre as manager? Just saw that Joe Torre was just on Mike Francesa's radio show today. I love how the media acts as if the Yankees are being just stubborn in having moved on from the Torre era. As if Torre's tell-all book "The Yankee Years" didn't play a huge part in why Torre is not celebrated in the new stadium. Put it this way, if Joe hadn't written that book, I could see the Yankees retiring his number in the near future, whenever he retired from baseball. But after the way he trashed The Boss when he was unable to defend himself, Brian Cashman even though Cash stuck up for him for years, and violated the clubhouse code in telling confidential discussions with his players, the chances that Torre will have such a Yankee tribute any time soon - or ever - are pretty slim. Hope Joe enjoyed all that money he made in biting the hand that fed him for 12 years. Anyhow, I wrote a piece for The Faster Times in response to something I saw in the media this morning, about how if Torre had stayed as manager with the Yankees, they not only would have won in 2009, but in 2008 as well. Guess Torre would have been able to magically heal the sick and injured as well. Not only do I not think that Torre would have won in 2008, I think the 2009 Yankees won because of, not despite, Joe Girardi. Read my take on why that is, and tell me what you think. 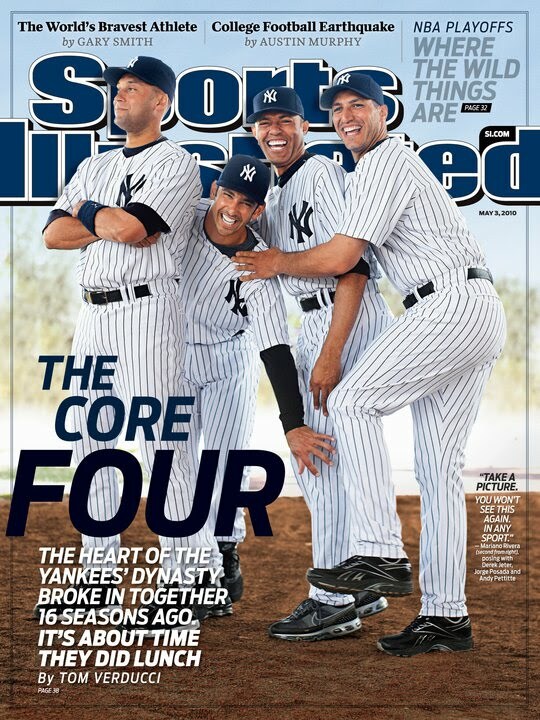 Did Tom Verducci and Sports Illustrated jinx the Yankees' 'Core Four'? If the Yankees' season goes up in flames any time soon, I know just who to blame - Tom Verducci and Sports Illustrated! Because as a firm believer in the SI Cover Jinx, I feel like this cover story about the Core Four is just asking for trouble - times four. It's why I was happy that Sports Illustrated picked the Phillies, and not the Yankees, to win the World Series. That jinx is powerful stuff - look what happened to the Mets' 2009 season after SI picked them to win the World Series! I'll be interested to see if Verducci, not exactly one of my favorite writers, is able to conjure up a new angle - or new tidbits - about the four players. Not very hopeful, though, given that the cover line says they "broke in together 16 seasons ago," when only two of them - Andy Pettitte and Mariano Rivera - were playing with the Yankees regularly in 1995. Jeter was a September callup that year and played 15 games. Jorge Posada played in exactly one game - without even a single plate appearance - that year. Posada wasn't on the full-time roster until 1997, and wasn't the No. 1 Yankee catcher until 1998. But even the faint hope of new anecdotes isn't enough to have risked the tempting of fate entailed with putting those four on the cover. I have to get all A.J. Burnett here - again - and ask why, why, why did SI do it? What do you think of this cover? Tell us about it! 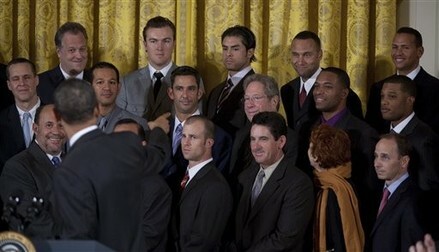 What were the Yankees thinking in these White House photos? What does this photo mean? John Sterling looks vaguely irritated, Derek Jeter and Alex Rodriguez look bemused, and Damaso Marte looks ebullient. I'd like to think that President Obama is asking John Sterling what's up with his home run calls. "Something Sort of Grandish? Are you out of your flipping mind?" the Prez could be saying. And the rest of the crew could be enjoying the joke. What's the deal with this picture? This photo seems like something out of "Law and Order." Girardi looks like the district attorney, announcing that some chronic miscreant has been hauled in for something or other. 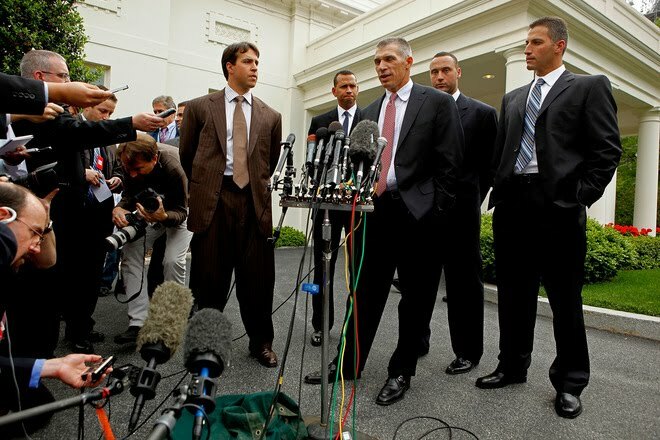 Andy Pettitte and Derek Jeter look like assistant district attorneys, and Mark Teixeira looks like the cop called in to tell the story in court. As for A-Rod? Well, maybe Girardi's announcing that they finally nabbed him... for breaking that unwritten rule against using the same plate twice at the salad bar! What is Michael Kay (top left) looking all so pleased about? Did the president announce that he listened to his ESPN radio show or something? Or maybe Obama said that he, too, despised condiments! The Wall Street Journal is making a push to expand both its sports content, and its New York content. To that end, they've done a study showing which Yankee takes the longest time around the bases (in case you were waiting for an answer to this burning question!) But this statistical analysis raises more questions than it answers. In case New Yorkers needed another way to compare Derek Jeter to Alex Rodriguez, we've found something new. When Mr. Jeter hits a home run, it takes him 20.19 seconds to round the bases, the second-fastest time among Yankees starters. Mr. Rodriguez needs 24.94 seconds, the slowest mark on the team. That sounds about right. A-Rod isn't a Manny Ramirezesque strutter, but he sometimes takes a second to look towards the Yankee dugout after hitting a homer. Plus, if it's a walkoff, he always throws his helmet in the air, which probably adds a second or two. My problem with the study is the methodology used. The WSJ claimed to have "clocked how long every 2009 home run took" for the Yankees. But they really only include the "current Yankee starters with at least 10 home runs last year" in compiling these numbers. That team average is "22.1 seconds—all of Mr. Rodriguez's home-run trots were slower than that." * By confining the study to "current Yankee starters with at least 10 home runs last year," the 52 combined dingers (21% of the 244 homers the 2009 Yanks hit) Hideki Matsui and Johnny Damon hit last season are not counted. * Curtis Granderson leads the team with the faster home run trot of 2009, at 18.8 seconds, even though his 30 home runs were hit for the Detroit Tigers. How in the world can you consider a "team average" home run trot that leaves out 33% of all the homers the Yankees hit last year? And then adds in somebody that wasn't even on the team then? This playing around with the numbers doesn't stop there. Even though the WSJ's numbers include Granderson, they do not include new Yankee Nick Johnson, one of the slowest players in baseball. That's because he only hit eight homers last year, and the study defined the criteria as having hit 10 or more homers last year. Sounds pretty sneaky, if you ask me, and it sure makes it look as if this "study" wanted to have a predetermined outcome. So the WSJ's big analysis features exactly seven Yankees: A-Rod, Jeter, Nick Swisher, Robinson Cano, Jorge Posada, Mark Teixeira, and Curtis Granderson, and covers only two-thirds of the homers hit by Yankees last year, with 30 additional homers by a speedy player who wasn't even on the team last year. Not very fair criteria, if you ask me. Now, it may very well be true that Rodriguez does have the slowest home run trot of the team, even if you count in all the homers. But the way the WSJ defined their criteria so narrowly doesn't exact inspire confidence. The Wall Street Journal may be a new player in the New York sports arena, but this piece's storyline sounds all too familiar. So why didn't the 1996 Yankees ever visit the White House? 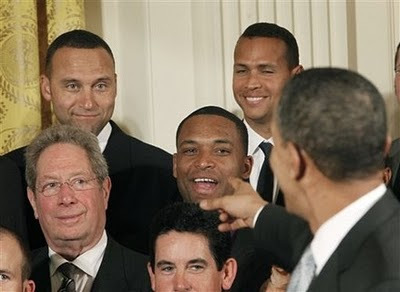 There's a whole slew of stories about how the New York Yankees are heading to the White House today, to be honored by Barack Obama for their 2009 World Series win. And most of the articles say that this will be the fifth time that the Core Four have been honored that way, saying they were honored in 1997, 1999, and 2000 by Bill Clinton, in 2001 by George W. Bush, and in 2010 by Obama. But these numbers are wrong. The Yankees never visited the White House after the 1996 World Series, and that non-visit was very controversial at the time. Who knows what the real story was, but the rumor of the day was supposedly that John Wetteland, who was very conservative politically, either instigated teammates to threaten a boycott, or was planning on confronting Clinton on his political views. And so the visit never happened. Wetteland couldn't be reached for comment, and although his agent, Adam Katz, admitted that the player throws from the right side in politics as well from the mound, Katz denied that the reliever led a Yankee rebellion against an invitation. "Yes, John is conservative politically, but he wouldn't impose his will on the rest of the club like that," said the L.A.-based Katz. "Didn't happen." "We've heard those stories, but the truth is the players had nothing to do with this," said Yankee spokesman Rick Cerrone. "Going to the White House to see the president, well, that sounds like a great honor, and there's no way a few players would get up and tell the owner, 'We are not going to the White House!' That's ridiculous." OK, then, Cerrone was asked, why didn't the Yankees ever visit with Clinton? "We didn't go because we were never invited," Cerrone said. According to Mary Ellen Glynn, a White House spokesperson quoted in the article, the Yanks didn't get an invitation at the time "because they won the World Series in the middle of a campaign." (Back then, such sporting event visits happened within weeks of the event, not many months later as they are now.) But the Clinton spokesperson told the Washington City Paper that "the president is a big baseball fan, and we love the Yankees, and we'd love to have the Yankees visit the White House if we can arrange it." "Realistically, I don't see how a trip like that could happen at this point," he said. "It wouldn't even make too much sense now. I mean, we're not even the same team any more as the one that won the World Series." Ironically, given the rumors of the instigation, John Wetteland was one of the Yankees no longer with the team. Anyhow, it took until 1999 for the 90s-dynasty Yankees to get that White House visit. 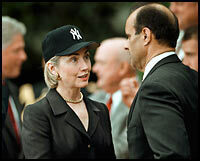 This one happened in June of that year, when lifelong Cubs fan Hillary Clinton, who was starting her campaign for the New York Senate at the time, put on a Yankee hat and announced that she had also been a lifelong Bombers fan. At any rate, I would still love to know what the full story was with the 1996 Yankees not getting the chance to visit the White House. Considering how many stories we hear about those years, it's curious that this is such a forgotten chapter in Yankees history! Even though you might expect Bronson Arroyo to take offense at Alex Rodriguez's supposed breach of unwritten rules against Dallas Braden, the Cincinnati Reds pitcher thought it was no big thing. Arroyo, discussing Thursday's incident in Oakland when the Yankees' Alex Rodriguez ran over the pitchers' mound after a foul ball prompting a stern reaction from A's pitcher Dallas Braden, said it was really no big deal. "Honestly, the thing about running across the mound, I vaguely know that the rule is there," Arroyo said. "I've never been on a team where it happened and somebody got fired up about it. I wouldn't think twice about A-Rod running across the top of my mound." Not surprisingly, this quote hasn't gotten any coverage. I found it buried in a roundup-type piece on MLB.com. Of course, if it had been a negative quote, it would have been front-page news. And people wonder why I complain about the sports media's bias! Both Tim Hudson and Chipper Jones thought A's pitcher Dallas Braden went overboard with his verbal salvo against A-Rod after the Yankee star crossed the pitcher's mound while returning to first base. "To be honest with you, I think it's a little much," said Hudson. "That's not an unwritten rule. Obviously Braden wanted to make a point. ... It looks a little bit silly. I think (Braden) might have took two or three cups of coffee too deep that day." Added Jones: "I didn't realize that pitchers got that upset. I think it was blown out of proportion. Seemed pretty childish to me. There are better ways to handle it, I think. ... I'll go out of my way to avoid the mound now." So yeah, most baseball fans aren't aware of those quotes, or even of the way that Derek Jeter and other Yankee teammates have had their third baseman's back. On the other hand, David Wells' criticism of A-Rod was treated by the media like he was the Oracle of Baseball or something. Given the way that he helped cost the Yankees the 2003 World Series by his inability to take care of himself - or to tell Yankee management his back was hurting - I wouldn't give his words any credibility whatsoever. But the New York Post's George King does, giving them more play than anybody else in an article on the issue. "I hated it when runners did that. I yelled at plenty of them," Wells said. "It's one thing to cross in the front of the mound before it goes up, but on top of it, that's wrong. The cleats [mess] up the mound. Pitchers don't go in front of fielders and put their spikes in the dirt. "I totally agree [with Braden] 'Get off my mound.' I would have done the same thing with A-Rod, or anybody else. [Bleep] it." * If it's such an unwritten rule that everybody knows, then why did so many runners in your day do this to you? * And if it happened so often that you "yelled at plenty of them," can you please name one of the players who did this? Thanks! Something tells me that if any reporter probed Wells further, he'd have nothing to back up his claims. Kind of like the way he had to backtrack on his own autobiography! The New York Times was wrong. Everybody doesn't hate A-Rod -- they hate Javy! I think this afternoon was the most I've seen Yankee fans enraged this year, between Javier Vazquez's bad pitching, Joe Girardi's indecisiveness about intentionally walking Kendry Morales, Scott Kazmir getting away with hitting Robinson Cano, Marcus Thames' bad outfield play, and a whole bunch of other shenanigans I'm trying to forget right now. But mostly Javy. As soon as I saw Morales' home run flying in the air, I turned off the TV in disgust and left the house. And from the stricken look on Girardi's face, he looked like he had had enough as well. He did the whole "head in his hands" thing, kind of like what Squawker Jon did when Luis Castillo dropped the popup in the Subway Series last year. Cheering for him is not going to make him pitch better. If he is booed, then maybe they will ship him off to Double A. Whether he is booed or not, the NY Media is going to really give it to him. So, Lisa what do you think of Havy now? He is what he was in 2004, lousy. He's good as a NL pitcher. No matter what the media or Cashman say, he can't cut it in the AL. He deserves to be booed, cuz he stinks! I disagree with you, just because he's I Yankee doesn't mean I can't boo him or have to like him. There are Family members I don't like and he ain't even family. Heh -that family line is pretty funny! So how bad are things today? I checked out ESPN NY columnist Wallace Matthews's take on the game for comic relief, and found myself nodding in agreement with a whole bunch of his points. Why did you pick this time to write a decent column, Wally? Thanks for nothing! The only bright side is that Squawker Jon pitched Javy in two of his fantasy leagues. Snicker. Anyhow, later on in the day, when I was channeling my inner A.J. Burnett, asking "why, why, why" Brian Cashman brought Javy back, I think I figured it out. Cash watched pitchers like Jose Contreras and Jeff Weaver struggle under Joe Torre and Mel Stottlemyre, then leave New York and get rings for other teams. Cashman has said that Vazquez struggled because of injury. But my theory, based on almost pure speculation, with a side order of hunches thrown in, is that Cashman also figured that the Joe/Mel brain trust held him back. And that now that Vazquez is healthy, and Joe Girardi and Dave Eiland would be working with him, that everything would be okey-dokey. Two problems with Cashman's faith in Javy: I'm not exactly Joe's biggest fan, but he did ask Javy repeatedly in the second half of 2004 if he were injured, as did Mel. And Vazquez insisted he was A-OK, when he wasn't. As much as I'd like to blame Joe for that, I can't. The second problem is that if Vazquez were too terrified/prideful/whatever to tell the truth the first time around, what made Cashman think that he could be trusted again, even with a new regime? Now the stakes are even higher for Vazquez. Is it beyond the realm of possibility that he might have some injury RIGHT NOW and be playing through it? Given his decreased velocity, the thought has crossed my mind. I hope Javy turns it around, but yes, I'm getting a little concerned. This could all become a vicious cycle and turn very ugly at the Stadium this weekend. I don't know what to think right now. Maybe I need to just give Squawker Jon a call and ask how his fantasy pitching stats went today! Today's New York Times' sports section features a front-page article by new Yankee beat writer Ben Shpigel about Alex Rodriguez . That's not exactly shocking, but the tone of the piece - and the pictures, headlines, and pull quotes to go along with it - is something out of the National Enquirer, not the Gray Lady. The print edition's headline is entitled "EVERYBODY HATES A-ROD," while the online edition calls him "The Man Baseball Loves to Hate." The print version of the piece features three photos of A-Rod - all unflattering. There are also eight (!) negative pull quotes about Rodriguez from everybody from Joe Torre (of course!) to Curt Schilling to Jose Canseco. The 950-word article continues that negative tone, featuring additional quotes from others, including Paul LoDuca and Matt Mantei. There are exactly two positive quotes in the story - one from Joe Girardi, and one from Torii Hunter. As I wrote in a piece for The Faster Times criticizing the article, it seems like the writer might have been channeling Earth Day with the way he recycled years-old quotes and grievances to make his point about how, well, everybody hates A-Rod! And he missed the real story on this - the way that this time around, everybody from Joe Girardi to Derek Jeter to CC Sabathia, Mark Teixeira, Andy Pettitte and Joba Chamberlain have all had A-Rod's back here. (Read their quotes in my Faster Times piece. Jeter's, in particular, is hilarious!) That is the real news here, not what Trot Nixon said five years ago. Contrary to Shpigel's insistence that "it has become a fashionable phenomenon to bash Rodriguez, something as popular as the Rally Monkey or the Phillie Phanatic," the reality is that the attacks on A-Rod have decreased over the past few years, due in no small part because he has kept his nose clean - and done fewer stupid things - over that time. Before Dallas Braden, when was the last time an opponent had something bad to say about A-Rod? It's been a while. Heck, with Teixeria spurning Boston for the Yanks last year, A-Rod wasn't even the most hated Yankee at Fenway! "Your A-Rod piece is way off base," I wrote. "He has more, not fewer, people in his corner than 5 years ago, especially since Torre is gone." I included a link to my article and also asked him, "Why did you do a 950 (word) piece recycling old quotes, and not new positive ones? Paul LoDuca makes cut, but Jeter/CC/Andy/Joba don't?" "Story wasn't about right/wrong or bashing/condoning his actions. No one else gets ripped more often than A-Rod. Simple." Oh, come on now, I thought! How could anybody not think that was a one-sided negative article! So I wrote back, "The headline says EVERYBODY HATES A-ROD. U used every single old negative quote u could find, and only 2 positive. Not bashing?" Sigh. To each his own. RT@ subwaysquawkers @benshpigel The headline says EVERYBODY HATES A-ROD. Not bashing? Ha! I made a New York Times reporter sigh! My day is complete! Although I still disagree with Shpigel, I do appreciate his taking the time to respond to me. But will he be more fair to A-Rod the next time out? If he isn't, I'll be the one doing the sighing. Dog days at Citi Field, but what about the cats? I had the Met game on in the background this afternoon, because I wanted my day to go to the dogs.. Today is the first Bark in the Park day at Citi Field, where dogs are welcome. Squawker Jon and I read in the paper last night that all the dog tix were sold out. I figured there would be some doggie scalper out there barking to his brethren about having extra tickets! They had a pre-game dog parade before the game, but according to Mets.com, "dogs will not be allowed on the field for the postgame Mr. Met Dash." Bummer. But what about the cats? A feline christened Kiti - I mean Citi - Field - on Opening Night last year. When are the cats of the world going to get their moment in the sun - and in the ballpark? Unfair, I say! As for Friday night's game at Citi Field, Squawker Jon revealed some scandalous news- that I actually wore the Mets ski cap. First of all, I wore the cap with the Geico logo up front, and the Mets logo in the back, kind of tucked in.. Then I decided to put the cap inside out, so there was no chance that the Met logo would be shown. Anyhow, I cheered for Melky Cabrera and Eric Hinske. Sadly, Melky got booed a lot, with one guy near us calling him "Yankee trash." I think he was just jealous of Melky's new ring. And yes, I did applaud Luis Castillo. And Ike Davis. As Riddering, one of our readers, notes, he looks like a young Bruce Springsteen. But not Chipper Jones. I do have some standards, after all! We were trying to figure who is the all-time Met villain. I say Chipper. Heck, some Braves fan wearing his jersey got the "Larry" chants on the way to the subway. We also tossed around the names Roger Clemens and Pat Burrell. But I'm going to have Metstradamus, the creator of the Hall of Hate, who his pick is. I'm about to be on my friend Larry Milian's show, on Fort Lauderdale's WFTL radio. If you're in South Florida, turn on 640 on the radio dial. Everyone else can listen live by going to WFTL's website. My first trip to Citi Field this season was a huge success. I went with Squawker Lisa, who was excited to see the new Braves - Melky Cabrera, Eric Hinske and Jason Heyward, in that order. * Ike Davis hit his first major league home run. And it was not a cheap shot, but a 450-foot bomb that went over the bullpen and almost reached the Shea Bridge. * Jose Reyes batted third for the first time. So far, so good for the new lineup, which produced five runs (with the help of four Braves errors). But the most important lineup change made this week was replacing Mike Jacobs with Davis. * Hisanori Takahashi got his first major-league hit. All right, nobody besides Takahashi cares about that, but he did save the game after Maine left with an injury, going three good innings and striking out seven. I'm glad Maine's not seriously hurt, but if he does have to miss a start, I look forward to a more important historic first from Takahashi - his first major-league start. Maybe Maine will end up in the bullpen, where he and the Mets might be better off. As great as it was to see Davis's first homer, it was almost as great to see Chipper Jones make two errors - misjudging a foul pop in the sixth and dropping a pop in the seventh. What was particularly satisfying about Chipper's drop was that Lisa did cheer for one Met tonight - Luis Castillo. Every time he came up, Lisa reminded me about his dropped pop in last year's Subway Series. She suggested that Castillo donate his glove to the new Met Hall of Fame. So when Met arch-nemesis Chipper dropped his own pop, helping along a Met rally, suddenly all seemed right in the world. Tonight was Ski Cap Night, which led to the final historic first - Lisa wearing a Met hat! Rest assured that she fussed with the cap to make sure the Met logo didn't show, eventually just turning it inside out. But it was brisk in row 11 of the upper promenade, so another questionable decision by the Mets - scheduling Ski Cap Night in late April - actually turned out to be a good one. The best decision the Mets have made in some time, however, was bringing up Ike Davis. It's not all him, but it's not a coincidence that a team that won only four of their first 12 games before he arrived has won four of five since Davis joined the team. After yesterday's whole A-Rod to-do, I tweeted Bay Area writer Jeff Fletcher, after the AOL Fanhouse writer wrote about the feud, noting my point about the "unwritten rule about nobody pitchers not getting to call out superstars." Jeff followed up by asking "Baseball Codes" co-author Jason Turbow about the "hierarchy of unwritten rules," specifically that one. Turbow seemed to think that what Braden did was fine, saying on Fletcher's Bay Area Baseball site that "I might have a problem with a young hothead trying to intimidate a star, but that isn’t this. Braden wants only what’s rightfully his, and he has every right to do so." I disagreed, of course, comparing A-Rod's dismissive reaction to Pedro Martinez's takedown of Karim Garcia with the "Who is Karim Garcia" line. And while I may be biased towards A-Rod, I also believe that nobodies shouldn't lecture superstars on baseball etiquette. Which is why I supported Francisco Rodriguez in his argument with Brian Bruney last year, even though K-Rod gets on my last nerve, and even though Bruney was a Yankee then. See, I don't remember any handwringing in the media about how K-Rod should have just kept his mouth shut, stayed classy, and let what Bruney said go, the way people are saying today that A-Rod should have done with Braden. In fact, pretty much everybody back then - including myself - thought the Met was completely justified in saying what he did. As I wrote, "Even though he's my least favorite Met, I gotta give Rodriguez credit here. Both quotes are classic. He was able to make Bruney look dopey just with these rejoinders." The only thing K-Rod erred in was in having to be restrained from physically attacking Bruney when they saw each other before a game. Rodriguez already won the argument with those lines; he didn't need to take it any further and threaten a physical fight. Speaking of the Mets, Squawker Jon and I are showing up at Shea...err, I mean Citi Field! tonight. I'm wearing one of my 2009 World Series shirts and rooting for Eric Hinske and the Melky Way! I fully expect boos - from Squawker Jon! I've decided who to blame for the Alex Rodriguez-Dallas Braden war of words at yesterday's game - Ken Singleton! The Yankee broadcaster made the mistake of saying during yesterday's game that everything was quiet around A-Rod this year. An inning or so later, A-Rod's supposed breach of baseball's unwritten rules ensued, and we got a bona fide A-Rod controversy again, for the first time this regular season. Hasn't Singleton learned by now that just when you think everything around Alex is smooth sailing, that something else will happen? I learned this lesson a few years ago, when I wrote a Squawk about how controversy-free A-Rod had been. I even made a joke wondering what he would have to do to get some front page tabloid headlines. Literally just a few hours later, Squawker Jon called me to tell me the breaking news of the day - A-Rod was dating Madonna! Anyhow, I can't believe people - including a few Yankee fans - are defending Braden, a guy who told ESPN that he was taught at Texas Tech (it figures!) that the mound was in the center of the diamond because the pitcher is "the center of the universe." Geez, and people think A-Rod's ego is out of control! Braden reminds me of the jerks you see everyday, who start fights when somebody innocently brushes against them, screaming about being disrespected. What a clown. Next time these two teams play I hope the entire Yankees team stands, spits, does jumping jacks and cartwheels on his mound before his first inning of work, and then continues to do so throughout the game. See how he feels after that. I've never heard of such a rule. To be honest, people are always coming up with unwritten rules that you're not supposed to do something that they don't happen to like, but usually, it's some old manager who is upset about a kid bunting to break up a no-hitter or something. THAT'S annoying, but when it's a fairly anonymous player springing an unwritten rule on a 34-year-old Hall of Famer who has been on the All-Star team since Dallas Braden was in the 6th grade. . .well, what can you say? Look, at this point, I want to see Alex Rodriguez combine his greatest hits and really show us something. Next time he is on base and there is a pop up around the mound, why doesn’t A-Rod cut across the field, step on the rubber, scream at the opponent trying to catch the popup and – if that doesn’t work – slap at the glove. No wait, don’t scream, belt out a Madonna tune. Hmmm, maybe Joel Sherman can do his own "greatest hits," like how he dug the graves of Mark Teixeira, CC Sabathia, and Curtis Granderson after their first Opening Days as Yankees. Or how he unprofessionally made numerous A-Rod centaur jokes on Twitter while in the workplace. Stay classy, Joel! Back to Braden. He threatened retaliation against A-Rod in the batter's box the next time he faces him. And that's okay? Can you imagine the outrage if, say, Joba Chamberlain had said something like that to an opponent? Unreal! Ike Davis - he can even field! Oh, Wally Matthews, how I've missed you so! Shocker! David Wright acquired by Pirates!